In August 2008, when 11 climbers died on K2, the world’s most dangerous peak, two Sherpas were among the survivors. They had emerged from poverty and political turmoil to become two of the most skillful mountaineers on earth. 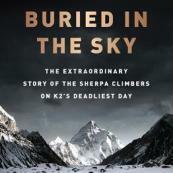 Amanda Padoan and Peter Zuckerman tell their stories in Buried in the Sky: The Extraordinary Story of the Sherpa Climbers on K2’s Deadliest Day. The book is a gripping adventure story and an exploration of Sherpa customs and culture. Dr. Eric Meyers also started climbing that day, but did not reach the summit of the mountain. He'll be joining Tom Williams for the hour to share his experiences treating the survivors, along with Amanda Padoan on Wednesdays's AU.